Having spent, collectively, about a century entertaining audiences from county fairs to Radio City Music Hall, Donny and Marie Osmond have learned to adapt. It’s Marie’s turn now, as vocal fatigue has sidelined Donny for the time being in their resident headliner show at Flamingo Las Vegas. Marie will be joined onstage during duets with Shane Baker, who has performed with her on her solo tour, “A Little Bit Country and a Whole Lot More,” and made his Flamingo debut with her Wednesday night. Shane’s father is renowned country music songwriter and producer Gary Baker, a member of Marie’s band years ago. In 1994, Gary Baker collaborated with Frank J. Myers on the Grammy Award-winning John Michael Montgomery hit “I Swear.” Shane Baker is an accomplished artist and producer based in the rich country music enclave of Muscle Shoals, Ala.
Donny’s first missed show was Monday night, and for the first time in Donny & Marie’s production at Flamingo Showroom, Marie performed as a solo act. This, after attempting to lure Chris Phillips of Zowie Bowie to the performance not long before the show was to begin. But on Tuesday night, Marie did find a suitable vocalist, and he’s a great one. Jamie Hosmer joined Marie onstage to sing a few numbers. Hosmer is best known as a vocalist and keyboardist with Santa Fe & the Fat City Horns at the Lounge at the Palms each Monday, and he’s also a member of Franky Perez’s band, which performs Saturdays at Rocks Lounge at Red Rock Resort. 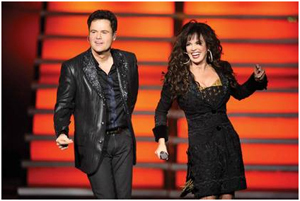 Those who were bent on seeing Donny & Marie, together, exclusively, can contact the Flamingo box office for refunds. This is not the first time one Osmond sibling has filled in for another. As Marie noted in a Twitter update, she was once felled by voice problems of her own during a performance in Toronto. As she wrote, “When I lost my voice in Toronto, Donny wore my Paper Roses skirt onstage. So should I wear his YO YO outfit with the purple scarf tonight?” The answer to that would be, “Why not?” And on the concept of Donny Osmond in a Paper Roses skirt … maybe Frank Marino at Imperial Palace has some competition from a highly unexpected source.